Instant’s resources for Achievement Standards provide ‘best practise’ teaching and assessing for Achievement Standards. Quality assured assessment materials (with QAAM certification) mean you can be sure that your students are given the absolute best opportunity to achieve at each level, and that the assessment schedule you are using is at the national standard. Briefs and scenarios which can be used as is, or adapted for the needs of your students. 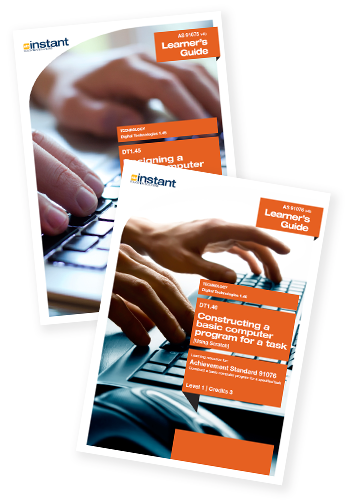 Exemplars and/or assessor’s comments for all levels – to help support your assessment judgements, and your students’ understanding of the requirements for each level. Direct links to the assessment materials. Content and activities which help to ensure students have the knowledge and practice opportunities to achieve up to Excellence. Only after the assessment resources are approved through this rigorous quality assurance process can the resources be considered ‘fit for purpose’. Once this is achieved the QAAM trademark is granted to Instant for use.